Organisers of the FIA Formula E Championship have today revealed the location and circuit layout of the Beijing Formula E Grand Prix – exactly six months ahead of the opening round of the new global electric race series. Taking place on Saturday, 13th September 2014, the inaugural Formula E race has been set around the grounds of China’s iconic Olympic Stadium, more commonly known as the Bird’s Nest and venue for the 2008 Olympic Games. 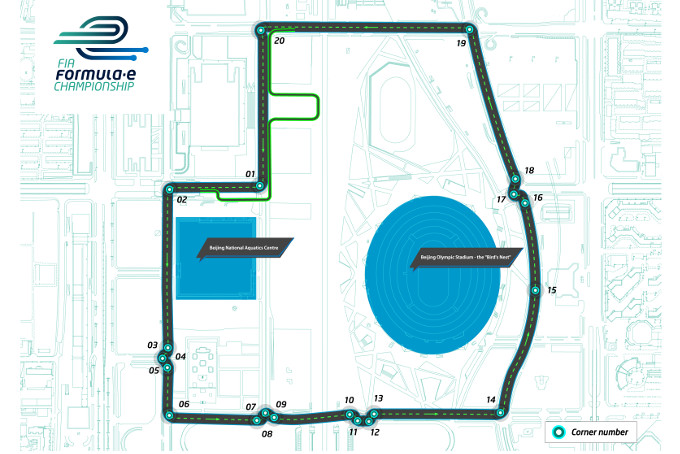 At 3.44km in length and featuring 20 turns, the anti-clockwise temporary circuit has been custom made by designer Rodrigo Nunes, working in close cooperation with the FIA, Formula E, the Republic of China Motor Sport Federation (FASC), the Olympic Park Committee, the Beijing Mayor, the Chinese Government and event organiser Team China Racing. The circuit, which remains subject to final FIA Homologation, boasts an impressive cityscape backdrop taking in both the Beijing National Aquatics Centre and the Olympic Stadium itself. It will see the 20 Formula E drivers tackle a mix of tight left-hand turns - offering late braking and overtaking opportunities - together with twisty chicanes and two main straights. In addition, the track features a unique ‘U-shaped’ pit lane with spectator areas located inside giving fans an incredible close-up view of the action. The Beijing Formula E GP circuit is the first of 10 city-centre races on the inaugural 2014/2015 Formula E calendar to be revealed. Formula E is a new FIA Championship using fully-electric single-seater race cars capable of speeds in excess of 225km/h. Ten teams, each with two drivers, will go head-to-head to create a unique and exciting racing series designed to appeal to a new generation of motorsport fans, whilst accelerating the electric vehicle market and promoting sustainability. Formula E races will be held over a single day in order to minimise disruption to each host city with the practice session, qualifying and 60-minute race taking place on Saturday followed by a live music concert. Further details, including ticket prices, will be available via the official Formula E website and via the forthcoming official Beijing Formula E GP website and social media channels.